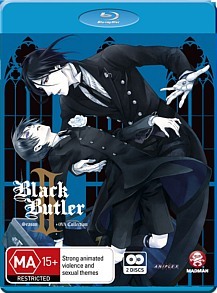 Black Butler: Season 2 + OVA Collection Review. The highlight here is undoubtedly ‘Ciel in Wonderland,’ which the box cover rightly proclaims as a firm fan favourite and which sees the characters from Black Butler playing out the storyline of Alice in Wonderland. Goethe’s Faust was an alright little romp, but 1) it’s over 200 years old rather tired and dusty, and 2) it doesn’t lend itself particularly well to Blu-ray. Luckily the thoughtful folks over at Japanese animation studio A-1 have remedied these deficiencies and the end product, Black Butler, is a darkly humorous meditation on love, family connections and the afterlife. And soul-eating. Sebastian Michaelis, demon, butler and all-around nice chap, has a deal with his master, the young and impossibly wealthy orphan Ciel Phantomhive: once his earthly duties are fulfilled and he has avenged the murders of Ciel’s parents, he will be allowed to kill the young man and consume his soul. Season Two introduces a major new player and a whole new household, namely that of the Trancy clan. Alois Trancy has a demonic butler just like young Ciel, however this sassy fellow, who goes by the imaginative name Claude Faustus, isn’t all that keen on devouring the soul of Alois, whom he finds far too dour for his liking. No, he has his sights set on getting the (presumably much tastier) soul of the newly amnesiac Ciel, and will seemingly stop at nothing in his attempts to get it. Perhaps to compensate for the fact Season Two is far shorter than the first, Madman’s new Blu-ray edition gathers together all 12 episodes as well as all six of the OVA episodes produced thus far. I’m actually not sure having a shorter run this time around is a bad thing: this season feels much more focused than the first, with fewer irrelevant side stories cluttering the main narrative and an emphasis on the cruelty and black humour which were always Black Butler’s strong suits. The two warring households and their grotesque inhabitants are also kept firmly at the centre of the plot, allowing the tension to build to a suitably bloody crescendo by season’s end. And then there’s the OVAs, which are only loosely connected to the main series and see the main characters undertaking a bizarre and highly entertaining series of (mis)adventures. The highlight here is undoubtedly ‘Ciel in Wonderland,’ which the box cover rightly proclaims as a firm fan favourite and which sees the characters from Black Butler playing out the storyline of Alice in Wonderland. It’s a suitably tongue in cheek tribute to Lewis Carroll’s oddball realm, and a fitting conclusion to this supremely worthy two-disc BD set.